There’s no denying that PEEPS are an iconic family favorite for Easter. Chances are, if you’ve been in a grocery store around Easter at some point in the last sixty years, you’ve seen (and probably eaten) these delightful marshmallow candies. It’s safe to say that my sweet tooth is just as insatiable as a child’s, so when I was offered the opportunity to express my PEEPS-onality by taking my favorite Easter candy and turning it into a fabulous craft, I jumped at the chance. 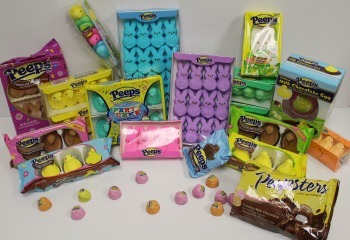 In addition to plenty of the standard PEEPS chicks and bunnies, I received a package of the Party Cake flavored PEEPS, a Large Marshmallow Bunny, two chocolate-covered PEEPS, and a bag of the new Peepsters. I may or may not have eaten all of the Peepsters as soon as I got them. 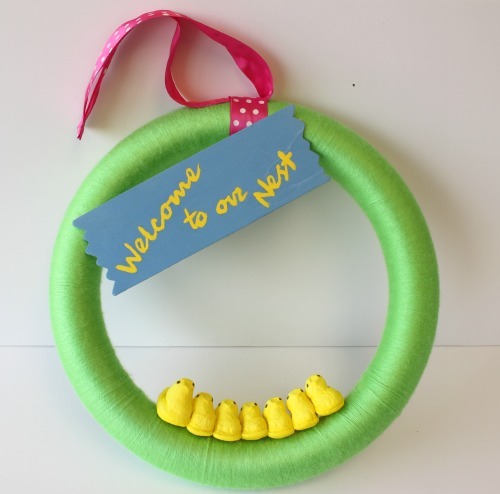 I’ve always wanted to try my hand at making a wreath, so I figured creating a PEEPS wreath was the most fun craft I could create. This wreath is easy enough that kids can help you make it, and you’ll be able to finish it relatively quickly. Plus, you can easily remove the PEEPS from the wreath when Easter ends, keep the wreath, and add new PEEPS next year! 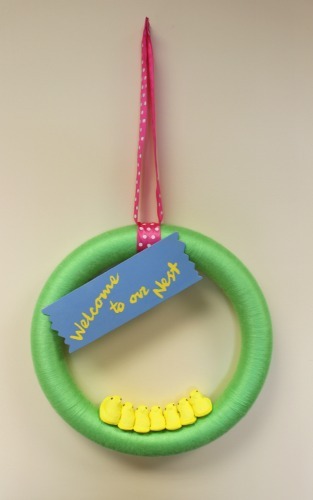 Want to make your own DIY wreath with PEEPS? Scroll down for my tutorial! 1) Tightly tie your yarn onto the wreath in a double knot. Cut the tail of the yarn relatively short so you can easily hide it as you wrap. 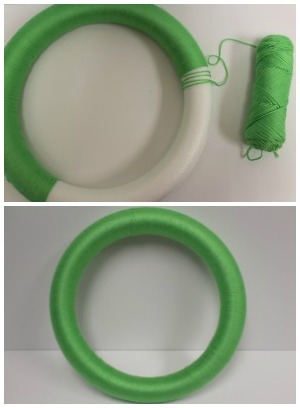 2) Steady the styrofoam wreath with one hand (you may want to set the wreath in your lap or on a table for extra balance) and hold your skein of yarn in the other hand. Holding onto the skein of yarn, loop your yarn around the wreath a few (3-5) times. Pull the yarn tight and gently push the loops together so that no white space shows. Repeat this step until the wreath is completely wrapped with yarn. Take care to hide all the white space and do your best not to overlap your strands of yarn as you wrap. It doesn’t have to be perfect, but you will want your wreath to look relatively smooth when you’re finished. When your wreath is completely wrapped with yarn, simple tie a knot and tuck the tail end so it doesn’t show. 3) Insert toothpicks into your wreath. Make sure the toothpicks are arranged in a straight line so your PEEPS will look uniform when you place them. You may need to test a few PEEPS on your toothpicks to make sure they will be close enough together. As you can see in the photos below, my PEEPS were too far apart on my first attempt. You want them to be very snug, like in the photo on the right. 4) Cut a small strip of ribbon (enough to wrap around the wreath once and have a little extra) and a long strip of ribbon. The long strip of ribbon will be used to hang your wreath. Place the longer strip of ribbon so that it is centered at the top of your wreath. Place the smaller strip of ribbon around your wreath, covering the longer strip of ribbon. Hot glue the smaller strip of ribbon so that it holds tight. Make to glue the smaller strip of ribbon at the back of the wreath so the ends of your ribbon don’t show in the front of the wreath. 5) Adjust the longer strip of ribbon so that you have an equal amount on both sides of the wreath. 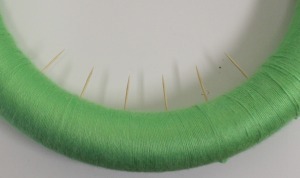 Fold down a small section of ribbon at each end and hot glue the ends together so that you form a loop. This is how you will hang your wreath. 6) Paint your wooden sign and allow it to dry. Once dry, add the “Welcome to our Nest” lettering. There’s no right or wrong way to do this- if you have naturally stunning handwriting (unlike me) you can easily freehand the saying onto your wooden sign. If you were not blessed with pretty handwriting, simply use Microsoft Word or a similar program to print your text, cut it out, and use those letters as a stencil. Once your lettering is completely dry, hot glue your wooden sign directly onto your wreath. 7) Hang up your hard work and get ready to celebrate Easter! The great thing about this DIY wreath is that you can ultimately customize it any way you want. I like simple home decor, which is why I chose to use the classic yellow PEEPS for this project, but you could certainly use any color combinations you want. For extra charm, use a different PEEP for each member of your family or add a few Easter-themed embellishments. When I was finished crafting my DIY wreath, I found a few miniature bird cages in my crafting room that were perfect for some of my leftover PEEPS! 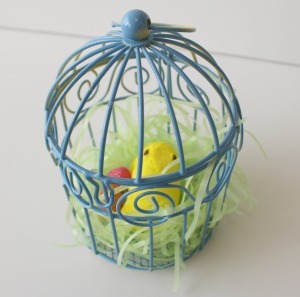 These little bird cages would be great for Easter brunches…especially because you can eat them for dessert! Have you ever crafted with PEEPS? Yesterday was the first day of spring, and over at AllFreeHolidayCrafts we only have one thing on the brain: Easter crafts! Head on over to our latest collection, and discover 9 different ways to hop into Easter. As soon as you open your free eBook, Fun Easter Crafts: 9 Easter Decorating Ideas, you’ll find yourself wrapped up in an assortment of cute and simple decorating ideas for your home. Don’t worry about setting up the same ‘ol decorations again this year, you’ll be able to afford brand new Easter decor with our handmade guide! It’s time to get your house in the Easter spirit, and Fun Easter Crafts: 9 Easter Decorating Ideas is the simple solution for crafters. Easter is a fun holiday that helps welcome the spring season; open up your windows, let the sun in, and start working on these cute decorations! These awesome Easter crafts celebrate the best parts of spring: bright colors, baby animals, and, of course, Easter candy. These great projects will add much needed color to your home after the long—unreasonably cold—winter. 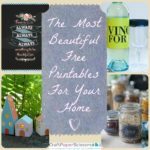 Quick, fun, and simple, these projects would also be great to do with small children. Bunnies, eggs, and lambs are all holiday staples for your seasonal Easter celebration, and you will find multiple projects with these themes in Fun Easter Crafts: 9 Easter Decorating Ideas. Don’t dwell on the cold winter, brighten up your home and welcome the sunshine season with these fun Easter crafts for the home. Decorating for a new holiday is the best way to start feeling the warmth of the season. Start with the Hoppy Easter Wall Hanging (pg. 4). With this cute wall decoration, you’ll be able to greet your guests with a special message from the bunny himself. Once you have finished your wall hanging, focus on the front door and try your hand at the Fluffy Feather Easter Wreath tutorial (pg. 7). This adorable Easter decoration can be put together in just four simple steps with the help of your trusty hot glue gun. Find them both inside Fun Easter Crafts: 9 Easter Decorating Ideas! Looking for ideas that the little ones can join in on? 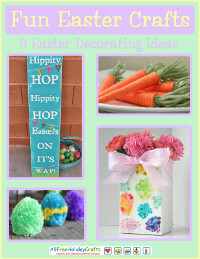 Don’t fret; Fun Easter Crafts: 9 Easter Decorating Ideas has just what you’re looking for. Set up a station and work on a set of Springtime Baby Carrots (pg. 23) with the kids. These cute carrots are so creative, you won’t believe how simple they are to make. 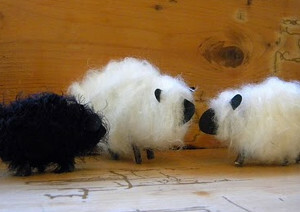 Perhaps the best of the Easter crafts for kids included in this eBook is the Fuzzy Yarn Sheep (pg. 24). Finding kid-friendly Easter decorating ideas that are as cute as this one can be a challenge, but with this craft, you’re on your way to a fun activity. From Easter decorating ideas you can work on yourself to family-friendly Easter crafts for kids, this selection of holiday ideas is the perfect one for any crafter looking for a new sense of holiday style! Grab your free, printable copy of Fun Easter Crafts: 9 Easter Decorating Ideas today! What is the greatest Easter craft that you have ever made? The next big holiday is Easter! Easter is a time of new beginnings after a long winter. The holiday is a great time to educate kids about spring, flowers, and everything turning green again! The best way to teach kids these ideas is through creative, interactive crafts. 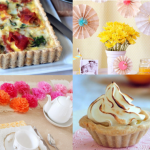 There are lots of great how-tos and crafting projects for Easter on the CraftFoxes website. 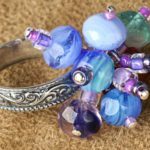 From cute hair accessories to springtime snacks, CraftFoxes has many options for crafts to make with your kids. Here are four projects you can work on with your kids to teach them all about the spring season. Get ready to have some fun as the weather gets warmer. When the weather warms up, kids are likely to see butterflies in the garden. Why not have them create and decorate some butterflies of their own? All you’ll need for this simple and fun craft is felt in bright, springtime colors, embroidery thread, an embroidery needle, along with other fun decorations. 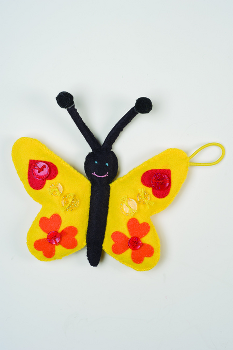 Sew the felt together to create the shape of a butterfly. Once the butterfly is constructed, let your kids join the crafting fun to decorate. Offer up glitter, sequins, buttons, beads, and anything else you may have on hand for them to use. This butterfly can be stuck to windows or even on the fridge with a magnet. You can learn more about this Easter craft for kids at CraftFoxes. Kids love snacks and Easter offers lots of different (and yummy) ideas for treats. This bunny is adorable, and the use of Cocoa Krispies will make it extra tasty! 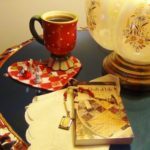 This recipe, which can be found on CraftFoxes, also includes chocolate morsels for that added kick of cocoa. Once you’ve made a batch of chocolate Rice Krispie treats, simply use a large circle-shaped cookie cutter to create the body of the bunny and a smaller circle to create the head. Then shape the mixture into ears for the bunny as well. Once you have everything prepared, call in the kids and have them help out in assembling the bunny rabbit and then decorating him. 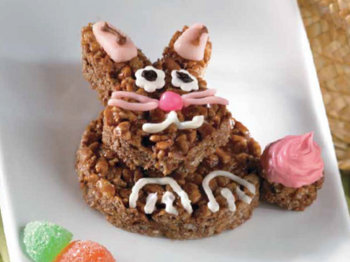 Learn more about the Chocolate Bunny Rice Krispies Treats Easter recipe! Do you love duct tape crafts? This adorable photo frame is made entirely with tape and would make a great Easter gift for grandparents, aunts, or uncles. 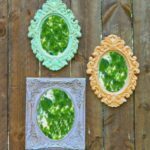 The frame is a simple craft, but it does involve a crafting knife so you’ll need to help your kids with it. You’ll also need a ruler, a picture of your child, a craft board, and differently colored Duck Tape. Because this is an egg frame, you might want to use pastel colors associated with Easter and springtime. Cut an egg shape out of some construction paper, and ask your kids for creative input — what designs would they like to put on the photo frame? Then, simply cut shapes out of your Duck Tape and decorate the photo frame. 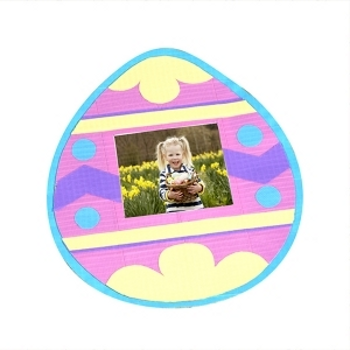 Learn more about this Easter Egg photo frame. Here is an easy sewing project for kids to try. If you’ve got a young child who’s interested in crafting and is old enough to try out sewing for kids, this would be a great crafting project for them to start with. 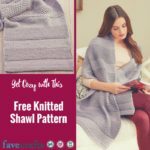 You’ll need embroidery floss, a needle, a rectangle of felt, yarn, a crochet hook, and some other decorations to use. 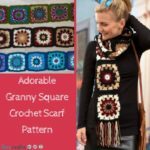 The bird’s nest made from yarn is simple enough, and you simply need to attach some beads for the “bird’s eggs.” Once the nest is affixed to the felt, close up the felt with a blanket stitch so that it’s wound around a ribbon to create a headband. Make sure the ribbon fits around the head of whomever wants to wear it, then close it up with elastic. 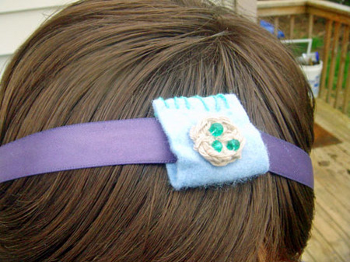 Not only is this a fun sewing project for kids, it’s also a lovely hair accessory to wear during spring and Easter. 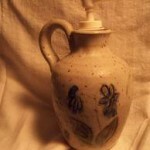 You can learn more about this craft at CraftFoxes. 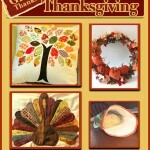 Don’t Miss It: “10 Sewing Ideas for Thanksgiving” Free eBook!